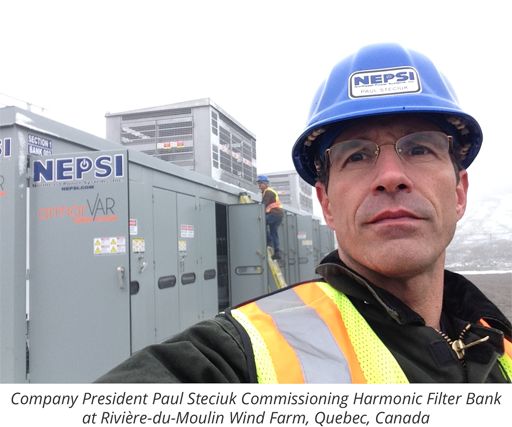 Paul Steciuk, president of Northeast Power Systems, Inc. (NEPSI) announced yesterday that NEPSI has completed commissioning of two 21.5 MVAR, 34.5kV Metal-Enclosed C-High Pass Harmonic Filters for the Rivière-du-Moulin Wind Farm. The C-High Pass Harmonic Filters are designed to provide 43 MVARs of reactive power, dampen resonance issues, meet utility interconnect requirements, and reduce harmonic voltage and current distortion at the point of common coupling. The wind farm, which is located in the unorganized territory (UT) of Lac Pikauba in the MRC de Charlevoix and the UT of Lac Ministuk in the MRC du Fjord is being developed by EDF EN Canada, a subsidiary of EDF Renewable Energy. With an installed capacity of 350MW, it will be the largest wind farm in Canada. NEPSI's contract with Construction Energie Renouvelable (CER), a consortium consisting of Construction LFG, EBC and Transelec Common, was to design, manufacture, test, ship, and commission two metal enclosed harmonic filters that could withstand near arctic like conditions found in this part of Canada. "What made this project unique was the arctic zone requirement, with snow depths expected to exceed 3 meters and extended periods of extreme subfreezing temperatures to minus 40 C," said Mr. Steciuk. NEPSI is the world's leading supplier of medium-voltage metal-enclosed capacitor banks and harmonic filter banks. NEPSI's equipment is used by industrial, commercial, and utility power system owners and operators with voltages from 2.4kV through 38kV to correct power factor and improve power quality.